Love is an ever-changing thing. As the world around evolves, the ideals of courtship seems stuck, all thanks to the romanticized models of some classic novels from the past. From “Pride and Prejudice” to “Wuthering Heights”, these novels epitomized romance. In Theater Reconstruction Ensemble’s You On the Moors Now, the philosophies of love are dismantled and put back together in a clever manner, mashing up four beloved romances. Written by Jacklyn Backhaus, You On the Moors Now pits the men against the women in the battle of love. You On the Moors Now takes the audience on a literary journey as four beloved romances are given new spin as four iconic women search for their own identity. 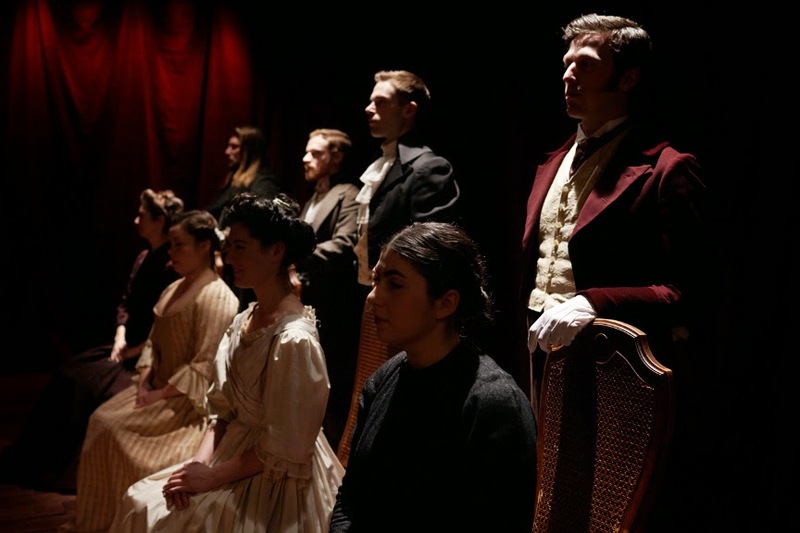 Lifting the characters from “Pride and Prejudice”, “Wuthering Heights”, “Jane Eyre”, and “Little Women”, Backhaus and the ensemble have put a current twist on these beloved stories by mixing language and themes while maintaining the integrity of the source material. Backhaus cleverly brought the weight of the theatrical theory the ensemble was tackling and blended heart with humor. Though some of the characters may have appeared as rejected characters from a great “Saturday Night Live” sketch, the commitment and dedication to the character was present. And hey, love is a funny thing! The large ensemble was filled with ability. With a veteran group of actors, the vitality on stage was contagious. It was quite evident that the cohesiveness within the two sets of ensembles, the quartet of lovers and the supporting players, was dynamic. The key players in the show were the eight lovers lead by Kelly Rogers’ Lizzy, Preston Martin’s Darcy, and Jon Riddleberger’s Rochester. Rogers gave Lizzy a wonderful presence, finding her own tones for the character through humor and heart. Martin’s Darcy and Riddleberger’s Rochester need their own spinoff with that adorable chemistry they had going on. Martin brought a colorful heightened hysteria to Mr. Darcy that was nothing short of scene stealing. Riddleberger’s mix of hilarity and desperation was charming. Witin the other group of actors, strong performances came from the character-driven Michael Barringer and the strong, grounded Claire Rothrock. Rothrock’s smooth toned River Sister was definitely a highlight. Director John Kurzynowski had a vision. Kurzynowski lead the entire team through the landscape that he and Backhaus established. The theatrical vocabulary was filled with specific nuances. From hand gestures to repetition in staging, the Kurzynowski and the ensemble knew the world inside and out. However, it didn’t always translate to the audience equally as well. Occasionally intellectual prowess replaced clarity. The clashing of the worlds, past and present, was made clear with the two distinct sets of actors, but until they interacted it was unclear why costume designer Joseph Wolfslau’s period and modern clothing appeared simultaneously. Storytelling was a heavy factor in understanding the arc and goal of You on the Moors Now. The individual actors had a role to play. But there was one who seemed to have two. Eben Hoffer began the evening introducing the piece and then taking his place at a desk behind a computer, assumingly playing music cues. And then he casually joined the supporting group. This affected some of the fluidity the piece was developing as well as trying to determine what his presence on stage meant. The soundtrack offered by sound designer Alex Hawthron fit the world nicely. The music was like a metronome for the pacing of the scenes. The lighting by Marika Kent was simple yet beautifully calculated. The set, also by Wolfslau, was simple until the wondrous reveal of the floorboards. While it was an intricate and interesting conceit, it did alter the fluidity that Kurzynowski had established as this transition was much slower and difficult to tackle. You On the Moors Now is a special piece of theater that explores an engaging topic. On the whole, it’s a captivating examination on courtship and our ideals of love, but this journey may only open eyes rather than minds.